HBO's television adaptation of Larry Kramer's powerful AIDS play The Normal Heart will have its UK premiere on Sky Atlantic this Sunday, 1 June, at 9pm - and the script is available to buy through our website now. Larry Kramer's passionate, polemical drama, first seen at the Public Theater in New York in 1985, is set during the early days of the AIDS epidemic in the 1980s. It follows the efforts of one man, while his friends are dying around him, to break through a conspiracy of silence, indifference and hostility from public officials and the gay community, and gain recognition for a disease that threatens to change everything. 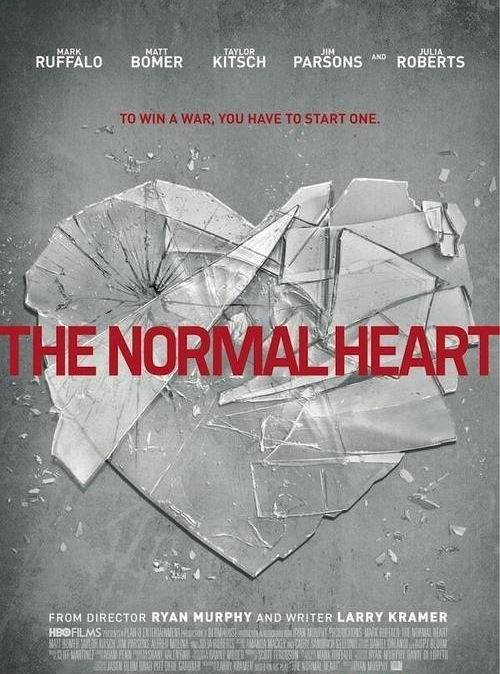 The Normal Heart transferred to the Royal Court Theatre in 1986, and won the Tony Award for Best Revival when it was staged on Broadway in 2011. Starring Mark Ruffalo, Julia Roberts, Matt Bomer, Taylor Kitsch and Jim Parsons, the HBO adaptation premiered on HBO in the US last weekend (25 May). It has been nominated for five prizes at the Critics' Choice Television Awards: Best Movie, Best Actor in a Movie or Mini-Series (Mark Ruffalo), Best Supporting Actor in a Movie or Mini-Series (Matt Bomer, Joe Mantello) and Best Supporting Actress in a Movie or Mini-Series (Julia Roberts). The playscript to The Normal Heart is availabe to purchase through our website at a 20% discount - click here to get your copy. The play is also available as an ebook. Nick Hern Books is to publish Monty Python at Work, a new book by Michael Palin that offers a behind-the-scenes look at the hugely influential comedy group, on 12 June 2014. Drawn from his published diaries, the book is Michael Palin’s account of the making of the Monty Python TV and stage shows, films, books and albums, spanning the period from the beginning of filming on Flying Circus, in 1969, to the opening of The Meaning of Life in 1983. Thanks to Palin’s as-it-happened accounts, we are taken behind the scenes to watch with unrivalled intimacy the creative processes that led to the finished work, seeing how it was actually put together. An intimate guide to the group's exploits, it will delight Python fans everywhere, and be a source of instruction and inspiration to students and those who seek to follow in the group's footsteps. The book will be launched with a talk and signing at the National Theatre, London, on Monday 2 June 2014 - for more information, and to book tickets, see here. The winners of the New York Drama Critics' Circle Award were announced today (6 May), with NHB author Conor McPherson's play The Night Alive named Best New Play. An inimitably warm and stylish play that deftly mines the humanity to be found in the most unlikely of situations, The Night Alive tells the story of down-on-his-luck Tommy. Renting a run-down room in his uncle Maurice’s house and lurching from one get-rich-quick scheme to the next, he starts to hope for a brighter future when he comes to the aid of similarly troubled Aimee. The play premiered at the Donmar Warehouse, London, in June 2013 to critical praise, with WhatsOnStage describing it as 'superb, vivid and violent... a brilliantly fused improvisation on Harold Pinter and David Mamet'. It later transferred to the Atlantic Theater, New York, where it ran from November 2013 to February 2014. The Night Alive was also recently nominated for Best New Play at this year's Olivier Awards. We're offering a special discount on The Night Alive to celebrate its New York success. Get 50% off when you order the book through our website - just use the code ALIVE at checkout. This offer is valid until 1 June 2014.